There are only a few things which could take this glorious moment away from us. The first one is that one of the two lose before the final. This is Ma Long's first appearance in the Olympic Singles so we don't know how he will play under this much pressure. For Zhang Jike his form has been in a slump for quite a while, will he be in top shape by Rio? The other thing is if they make the final and the match isn't as glamorous as we hope. Many of Zhang Jike and Ma Long's more recent clashes have been much less inspiring than their old battles. Aside from that we can only hope that two of the best players of the modern age will be ready to give it their all for the prestigious Olympic gold medal. For Ma Long it is the opportunity to become a Grand Slam Champion and join the ranks of the best players in history. For Jike it is the chance to make unmatched history by claiming a second Grand Slam. Head to Head in ITTF events it is Ma Long who leads 10-5 but in Rio the stats will be out the window. It will be a battle of skill, tactics, experience and mental toughness! In the women's singles it was Liu Shiwen who has been set aside to potentially allow for a repeat of the London 2012 final between Li Xiaoxia and Ding Ning. Should the two make the final again could we see a similar result or will Ding Ning learn from her London experience and tough it out to take gold? Who knows! It promises to be exciting! How do Xu Xin and Fan Zhendong feel about being set aside? Zhang Jike already has one gold. Does he need more? I guess the coach thinks he can rise to the occasion. I think he can be upset by other players before reaching the final. That's why he is currently #4 among the Chinese players. Must be a Butterfly influence. Thanks for share a article but this picture remark quite. It is starting to get boring. Chinese players winning all the time. Sure they win because they are good but if I were a billionaire I would give 5 million dollars to the first non chinese player who can consistently beat them. That should spur the rest of the top non chinese players to lift their level of play. I wish to see a all non chinese Olympic final. Hope my dream comes true. Great ! 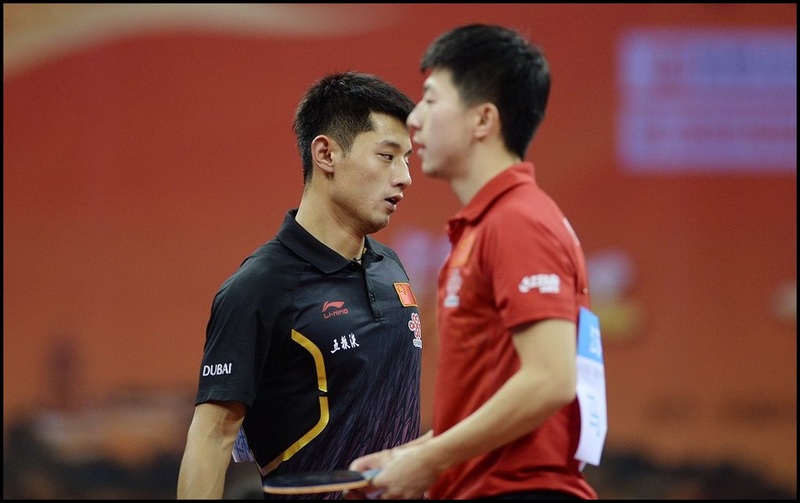 !ITTF recently posted online that Ma Long and Zhang Jike were the two Chinese players confirmed to be entered in the Singles event for the 2016 Rio Olympic Games. This presents an opportunity for a truly epic battle. The two best players in the World on the biggest stage of all. Your article has good information regarding updates!